In case you haven’t heard the news, Texas World Speedway just outside of College Station, TX will be closing at the end of May. While we will be sad to see it go, we’re going to send it out with a THREE-DAY Track Guys event, March 27, 28 & 29, 2015. Friday is limited to Track Guys Instructors as well as Intermediate- and Advanced-level drivers and we’ll be running clockwise. 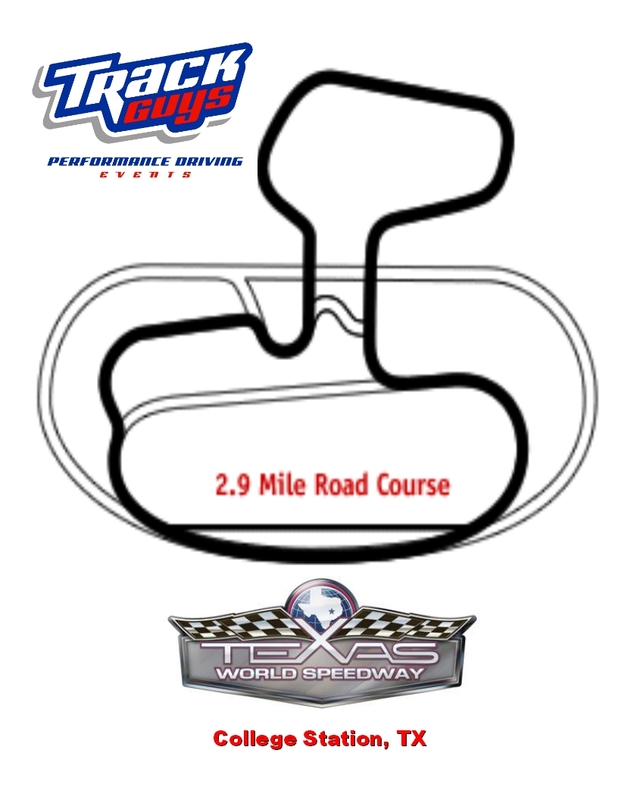 Saturday and Sunday we’ll be running TWS’s 2.9 mile road course in the more traditional counter-clockwise direction and will be the “full-school” event open to drivers of all experience levels. The Mustang Club of America has designated this as one of their “National” driving events and we are very proud to be working with the largest Mustang club on the planet. As part of their support of the event, the MCA is providing a FREE LUNCH to all driving school participants on Saturday, so be sure to stop by their display, thank them and check out all the Mustang Club of America has to offer. Go here to register online or simply click on the logo below. Not sure if this “performance driving thing” is for you? For just $50 our Track Guys Test Drive is just that: a smaller “sample” of our time-proven performance driving education experience. Test Drive participants attend the Saturday AM driver’s meeting, two classroom sessions and then drive the noon-time parade laps before getting their own “Test Drive” session on the track, at-speed with one of our in-car instructors riding along to help you “get your speed on”. If you want to run the Test Drive Program, you can sign up for it on the same registration site as the full-school drivers. We are very blessed and thankful for our sponsors for this event. Some of these companies have been with us for years, while others are just now coming on board. Please be sure to visit their websites, check out their products and services and let them know how much you appreciate their support. 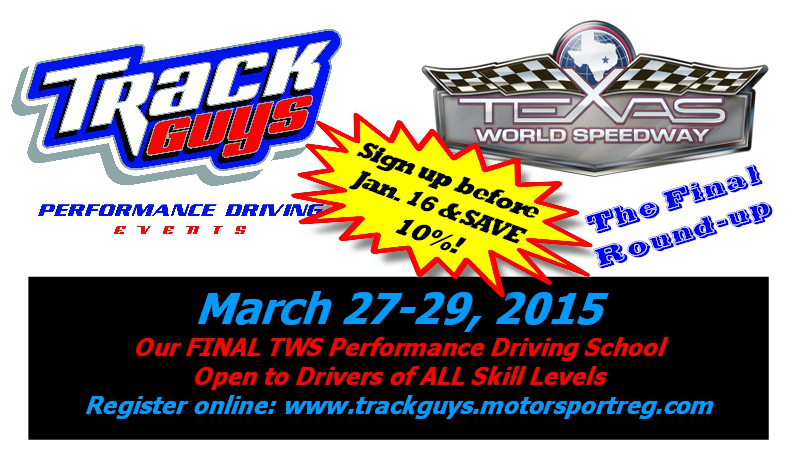 We hope to see you at TWS for our Track Guys Final Lone Star Roundup at TWS. 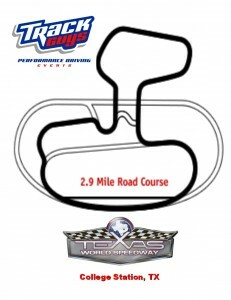 This entry was posted in Track Guys Events, Tracks and tagged high-performance driving, On-track performance driving, Performance driving, Texas World Speedway, Track Guys Performance Driving Events. Bookmark the permalink. Just a thank you for the wonderful time you helped me have with my Son, Travis Cooper at Sebring, this past May 30-31, 2015. It was a prayer answered, and a dream come true. You guys are the real deal when it comes to what’s a “Good-Guy”? you two, and you lap-happy crew of speed demons on the track. God-Bless and Thanks!